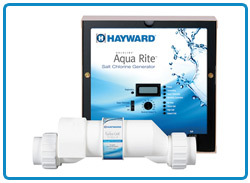 The Hayward® Aqua Rite has been #1 selling electronic chlorine generator in North America for the last decade! It eliminates the need to mix, measure and mess around with liquid or tablet chlorine and dramatically enhances the swimming experience. With three available cell sizes, customers can ensure the most efficient and cost- effective chlorination possible for their pool! 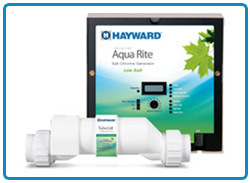 The Aqua Rite Low Salt Chlorine Generator from Hayward offers the same simple, safe and affordable approach to pool sanitization that you would expect from the original Aqua Rite, but uses virtually half the amount of salt, making it an even more environmentally friendly approach to salt chlorine generation.